Below you fill find all funeral homes and cemeteries in or near Cedar Hill. 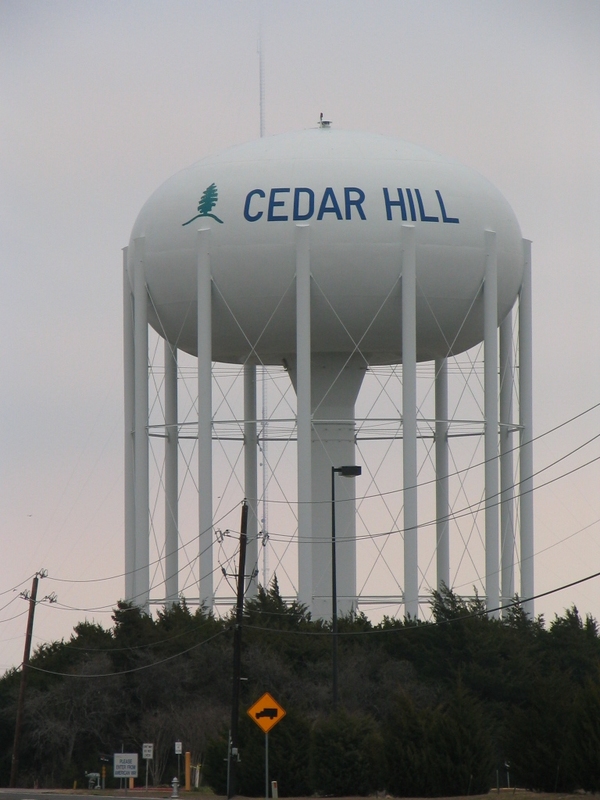 Cedar Hill is also known as: The Hill Country of Dallas County. Their current mayor is Mayor Daniel C. Haydin Jr..
Zip codes in the city: 75104, 75106. Dallas County funeral flowers can be purchased from one of the local funeral shops we partner with. Some of the notable people born here have been: Henry Melton (american football player), and Josh Thomas (american football player). Cedar Hill is a city in Dallas and Ellis counties in the U.S. state of Texas. It is located approximately 16 miles (26 km) southwest of downtown Dallas and is situated along the eastern shore of Joe Pool Lake and Cedar Hill State Park. The population was 45,028 at the 2010 census.Cedar Hill is a suburb of Dallas and is part of the Best Southwest area, which includes the nearby cities of DeSoto, Duncanville, and Lancaster.Early in its history, Cedar Hill lay along a branch of the Chisholm Trail and served as the temporary county seat of Dallas County. In 1856, a tornado swept through the town killing nine people and destroying most of its buildings. The seat of the county was moved to Dallas not long after. It was revealed on March 20th, 2018 that Kathryn Ann Hileman (Stevens) perished in Cedar Hill, Texas. Send flowers to share your condolences and honor Kathryn Ann's life. It was revealed on April 5th, 2015 that Winifred Darlene Jackson (Robertson) died in Cedar Hill, Texas. Ms. Jackson was 89 years old and was born in Des Moines, IA. Send flowers to share your condolences and honor Winifred Darlene's life. It was noted on April 1st, 2015 that Winifred Jackson perished in Cedar Hill, Texas. Jackson was 89 years old. Send flowers to express your sorrow and honor Winifred's life. It was reported on December 7th, 2014 that Carleen Nolte (Hendrickson) perished in Cedar Hill, Texas. Ms. Nolte was 89 years old. Send flowers to share your condolences and honor Carleen's life. It was disclosed on November 30th, 2013 that Doris McPeak (Cypert) died in Clearfield, Utah. Ms. McPeak was 95 years old and was born in Cedar Hill, TX. Send flowers to express your sympathy and honor Doris's life. It was reported on July 11th, 2013 that Barbara Ann Mauldin (White) passed on in Cedar Hill, Texas. Ms. Mauldin was 85 years old and was born in White River, SD. Send flowers to express your sympathy and honor Barbara Ann's life. It was noted by Abilene Reporter-News on March 28th, 2013 that Bernice Madeline Brazzil (Levrets) died in Cedar Hill, Texas. Ms. Brazzil was 87 years old. Send flowers to express your sympathy and honor Bernice Madeline's life. It was revealed by Odessa American on December 7th, 2012 that Eulalia Garcia (Nunez) died in Cedar Hill, Texas. Ms. Garcia was 75 years old. Send flowers to express your sympathy and honor Eulalia's life. It was disclosed on April 19th, 2012 that Daisy Maxine Hollmon (McDonald) died in Cedar Hill, Texas. Ms. Hollmon was 76 years old and was born in Laurel, MS. Send flowers to express your sorrow and honor Daisy Maxine's life. It was reported on March 13th, 2012 that Frances Peterson (Bailey) died in Cedar Hill, Texas. Ms. Peterson was 94 years old. Send flowers to express your sympathy and honor Frances's life. It lies sixteen miles from downtown Dallas, Texas and is adjoined by Joe Pool Lake and Cedar Hill State Park to its west. Cedar Hill is a city in Dallas County, Texas and Ellis County, Texas Counties in the US state of Texas. . . . The official website for the city of Cedar Hill is http://ci.cedarhill.tx.us/. BELL Jimmy Lee "Bay-Bay" Bell, age 57, of Cedar Hill, Texas, formerly of McComb ... MS. Burial will be in Dinah No. 2 Cemetery in McComb. with Craft Funeral Home of McComb in charge. We now faced Abby and Carol's funeral. It was only moments earlier that I saw Abby ... The Trinity Church Assembly of God in Cedar Hill, Texas, garnered controversy by depicting a school shooting in the wake of Columbine and an attack at a nearby church. Find BBB Accredited Funeral Services near Cedar Hill, TX - your guide to trusted Cedar Hill, TX Funeral Services, recommended and BBB Accredited businesses. Find BBB Accredited Funeral Homes near Cedar Hill, TX - your guide to trusted Cedar Hill, TX Funeral Homes, recommended and BBB Accredited businesses. Find a Funeral Home inCedar Hill, Texas TX to provide the caring burial and ceremonial services your family deserves. Florists in Cedar Hill, TX on Yahoo! Local Get Ratings & Reviews on Florists with Photos, Maps, Driving Directions and more. We work with local florists and flower shops to offer same day delivery. You will find budget sympathy flowers in Cedar Hill here. Our funeral flowers are cheap in price but not in value.